Russia, Iran and the United States are drawing new red lines for each other in Syria, with Moscow warning Washington on Monday it would treat any U.S.-led coalition planes in its area of operations as potential targets after the U.S. air force downed a Syrian jet. Tensions escalated on Sunday as the U.S. army brought down the jet near Raqqa and Iran launched missiles at Islamic State targets in eastern Syria – the first time each state has carried out such actions in the multi-sided Syrian war. A pro-Damascus commander said Tehran and Washington were drawing “red lines”. Russia, like Iran an ally of President Bashar al-Assad, issued a warning of its own to the United States in response to the downing of the Syrian jet, saying on Monday it would view as targets any planes flying west of the Euphrates River, though it stopped short of saying it would shoot any down. The incidents reflect mounting competition for areas of Syria where Islamic State (IS) insurgents are in retreat, leaving swathes of territory up for grabs and posing the question of what comes next for U.S. policy that is shaped first and foremost by the priority of vanquishing the jihadists. The United States said the Syrian army plane shot down on Sunday had dropped bombs near fighters of the Syrian Democratic Forces (SDF), a U.S.-backed alliance of Kurdish and Arab fighters battling to capture the city of Raqqa from IS. Russia’s Defense Ministry responded on Monday by suspending cooperation with the United States aimed at avoiding air incidents over Syria, where the Russian air force is bombing in support of Assad’s campaigns against rebels and IS. The Syrian army said the jet was shot down while flying a mission against Islamic State. The SDF however accused the Syrian government on Monday of attacking its positions using planes, artillery and tanks. “If the regime continues attacking our positions in Raqqa province, we will be forced to retaliate,” SDF spokesman Talal Silo said. The Syrian government this month marched into Raqqa province from the west but had avoided conflict with the U.S.-backed SDF until the latest incident. “The SDF is getting big-headed,” said the pro-Damascus military commander, a non-Syrian who spoke to Reuters on condition of anonymity. “There could be problems between it and Soheil Hassan,” said the commander, referring to the Syrian officer leading the government offensive in Raqqa province. The United States has said its recent actions against Syrian government forces and allied militia have been self-defensive in nature, aimed at stopping attacks on U.S.-led coalition forces or their local allies. 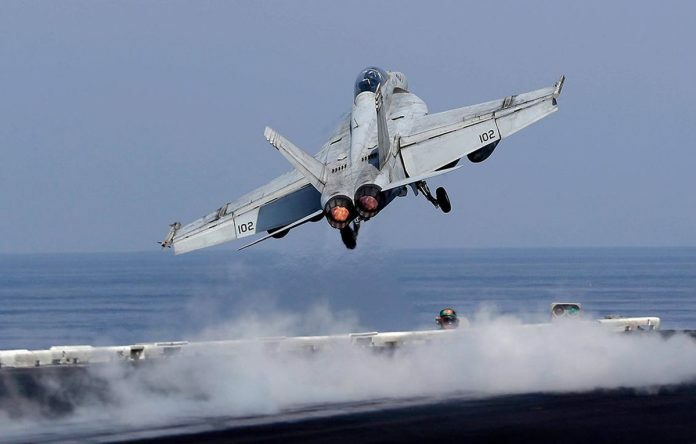 These have included several air strikes against pro-government forces that have sought to advance towards a U.S. military base in southeastern Syria near the border with Iraq, where the U.S. military has been training rebels to fight IS. The area is of strategic significance to Tehran as it seeks to secure a land corridor to its allies in Iraq, Syria and Lebanon and establish a “Shi’ite crescent” of influence that has long concerned U.S.-allied states in the Middle East. The missiles fired by Iran’s Revolutionary Guards on Sunday targeted IS in Deir al-Zor province, fast becoming the jihadists’ last remaining foothold in Syria and a declared military priority of Tehran’s allies in the Syrian government. The attacks have showcased the depth of Iran’s military presence in Syria: Iranian drones launched from areas around Damascus allowed Revolutionary Guard commanders to assess the damage done by the missiles in real-time. Two top Revolutionary Guard commanders said that the strikes were intended to send a message to the perpetrators of militant attacks in Tehran last week – claimed by Islamic State – that killed 18 people, as well as their supporters. “I hope that the clear message of this attack will be understood by the terrorists as well as their regional and international supporters,” said Amir Ali Hajizadeh, the head of the Revolutionary Guards’ aerospace unit, according to the website of Iranian state television. Six missiles with a range of between 650 to 700 kilometers (400-435 miles) were fired from western Iran, soaring over Iraqi territory and striking the targets in Deir al-Zor. State TV posted black and white aerial video on their website on Monday which they labeled as the moment of impact of the attack. A projectile can be seen hitting a building followed by thick black smoke billowing out. State TV repeatedly aired video footage of the beginning of the attack Monday, showing several missiles streaking across a dark night sky. Iranian Foreign Minister Mohammad Javad Zarif defended the attack in a Twitter post on Monday. “Iran’s missile capability protects its citizens in lawful self-defense & advances common global fight to eradicate (IS) & extremist terror,” he wrote. Other Iranian officials were more blunt in their assessment of the attack. “This attack, before being a message for the terrorists, is a message for the supporters of terrorism in the region which are symbolized by the Saudi regime and the Americans,” the state television website quoted Iranian parliamentarian Javad Karimi Qoddousi as saying. Analysts say that more robust U.S. military action in Syria since President Donald Trump took office in January has resulted from his decision to give the military more autonomy in how it pursues the war on Islamic State. “The (Syrian) regime is always testing and pushing the boundaries,” said Yezid Sayigh, a senior fellow at the Carnegie Middle East Center in Beirut. U.S., Russia, Iran draw new red lines in Syria. Moscow is treating U.S.-led coalition planes in its area of operations as potential targets.